The definition is pretty simple. 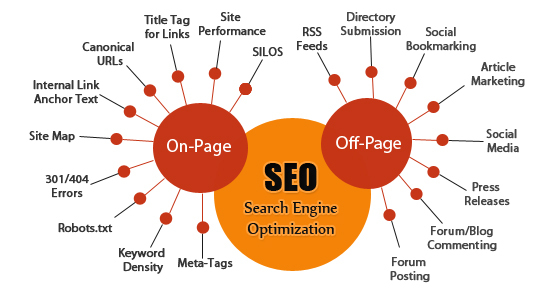 On-page SEO is the term given to all of the work that relates to all of the work on your actual website such as your text content, titles, description and other on site optimization. In contrast, off-page SEO is the work that is done outside of your website, predominantly link building and content development that aims to improve your websites authority and page rank. So the question remains which is more important in terms of improving your search engine rankings? Although both on page and off-page SEO are both very important, in my opinion on-page is the most critical and holds the most weight within search engines. My reasoning for this is if your on-page SEO is not done well, and your website violates Google Webmaster Guidelines then it doesn’t matter how many high quality back links you have, your site will not rank to its full potential. In addition, if you complete no off page work, but you have a high quality website with great content, your site can still rank #1. When commencing SEO for the first time you should always start with the on page work prior to commencing any link building. If you start your off page work first, then a lot of the work you do might be all in vain. In conclusion, both on page and off-page SEO are very important, however if deciding which is more important, I would always go with on-page SEO. This is the way to go when doing seo for new website, make sure you give your website the best start in its infancy with effective SEO strategies. Contact Lawyers SEO if you need assistance with reaching your online goals. We specialize in generating new businesses for lawyers and attorneys. Phone us at (213) 784 2700 for a free professional SEO consultation.